Like I said, I had my doubts. But, now I get it. I’ve read articles. I’ve talked to the customers. I’ve been to the Lawson user group meetings. I’ve seen Dean Hager’s presentations, and talked with him about where Lawson is going now that they’re part of Infor. And, I’m in. All in. InforGuru.com in. Let me explain why. Infor’s pedigree has been one of growth by acquisition. If—like me—you grew up in this industry, you remember some of the heavyweights. Names like Baan. Like McCormick & Dodge and MSA, which merged into Dun & Bradstreet Software, and subsequently acquired by Geac. Extensity, acquired by Geac. Geac then acquired by Infor. And, Infor is owned by Golden Gate Capital. A lot of disparate companies with a portfolio of disparate products. And a well-deserved reputation for buying companies, not integrating the products, and not adding any innovative value. Once upon a time not so long ago, Infor CEO Charles Phillips worked for Oracle, where he was the heir apparent to CEO Larry Ellison. Ellison grabs Mark Hurd after Hurds’s unceremonious ouster from HP, and Philips departs. 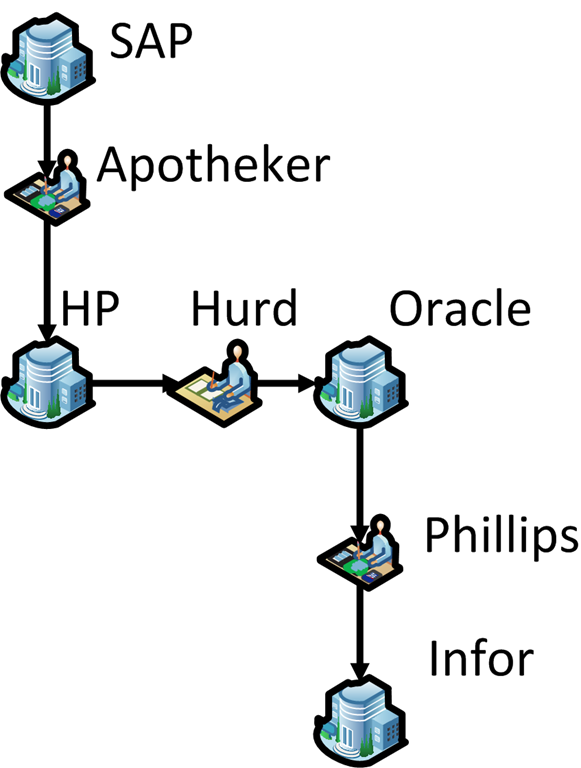 A month later Phillips is hired at Infor, which just happens to compete with Oracle. And to top that off, who replaces Mark Hurd at HP? SAP’s Léo Apotheker, who lasted less than a year. Got all that? So, don’t you think Phillips might be just a wee bit motivated to show Oracle their big mistake? Phillips was hired synthesize them into a cohesive strategy. As part of that strategy, he targets Lawson, needing to fill in some holes in the Infor offerings. In particular, Human Capital Management (HCM), Lawson’s Talent Management, and the healthcare vertical market. Rather than continue to try and bolt together these products in an end-to-end fashion, Infor is offering Infor10. At the core sits a new middleware, Ion. Coupled with a new UI, Infor Workspace. Infor Workspace is built on Microsoft SharePoint, a pervasive solution running in many organizations. Using Infor Workspace, you can switch from Infor SyteLine ERP system running on a local server to Infor Expense Management in the cloud, or to Infor EAM deployed at another site. The user experience stays consistent across all of the applications. Enter Lawson S3. With Infor10 and Lawson 10, you can use your Lawson S3 applications as well. Click on the screenshot, and watch the video. I think you’ll be pretty impressed. No, Lawson S3 applications are not going away yet. Of course, I’d expect some of them to change and merge with other products and features. We’ve already seen integration of Lawson within Infor Workspace, offering what is effectively a super-charged alternative to Lawson Portal. It’s exciting. We know it’s not going to happen overnight. There will be some bumps. But Infor and Lawson have shown they are serious. In fact, Lawson hired 75 new developers after the acquisition. While Infor and Lawson are still stand-alone entities, owned by Golden Gate Capital, and likely will remain that way for a while, we can them to become one. A solid opportunity, which we hope will result in greater capabilities and better solutions. It’s truly a matter of 1 + 1 > 2. Finally, let me be clear. Infor didn’t spend almost TWO BILLION DOLLARS to flush away Lawson and its customers. And what about M3 and its future? any comments on this? Tell us more about ION. Will S3 applications run on top? What about the Landmark modules such as Talent Mgt/Contract Mgt…will they also run on top of ION? They are so tightly integrated with Landmark, I wonder how plausible that really is…. The biggest challenge for INFOR/Lawson right now is they have 3 different application deployment stacks, numerous development toolkits, and a gaggle of products/modules that can barely talk to each other…and thats just Lawson’s baggage. There needs to be a RADICAL rethink of product strategy and direction. If the majority of Lawson customers are where we’re at, then we expect consolidation and clarity on these issues before we’ll invest further. Can anyone tell me of a company of companies in the Dallas, TX area that uses Lawson Absence Management. I have a new position where I use the system and the training I had from the departing employee was minimal. My company did not budget for any generalized training and I’m not fully comprehending the set-ups based on the multiple different requirements per each division within my company. I’m looking for someone who can help with walking through the different vacation set-ups I encounter.